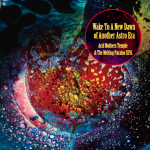 Acid Mothers Temple: the Next Generation begins! In the autumn of 2014 Shimura Koji left the group after 7 years on drums, and in late 2015 bassist Tsuyama Atsushi left after 17 years. In their places have come two young musicians: Satoshima Nani on drums and S/T on bass. This year it will be 21 years since we formed Acid Mothers Temple & The Melting Paraiso U.F.O., and now with the New Generation we have started walking yet another new path. This latest album, “Wake To A New Dawn of Another Astro Era” therefore marks a new point of departure for the group, the first album in our second chapter.